S. typhi is spread through contaminated food, drink, or water. If you eat or drink something that is contaminated with the bacteria, the bacteria enter your body. They travel into your intestines, and then into your blood. The bacteria travel through the blood to your lymph nodes, gallbladder, liver, spleen, and other parts of the body. Some persons become carriers of S. typhi and continue to release the bacteria in their stools for years, spreading the disease. 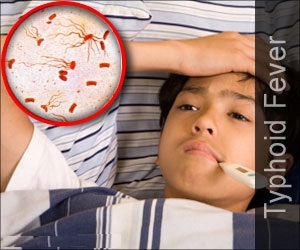 Typhoid fever is common in developing countries. Fewer than 400 cases are reported in the U.S. each year. Most cases in the U.S. are brought in from other countries where typhoid fever is common. Some people with typhoid fever develop a rash called “rose spots,” which are small red spots on the abdomen and chest. A blood culture during the first week of the fever can show S. typhi bacteria. Fluids and electrolytes may be given by IV (into a vein). Or you may be asked to drink uncontaminated water with electrolyte packets. Antibiotics are given to kill the bacteria. There are increasing rates of antibiotic resistance throughout the world, so your health care provider will check current recommendations before choosing an antibiotic. A vaccine is recommended for travel outside of the U.S. to places where there is typhoid fever. The Centers for Disease Control and Prevention website has information about where typhoid fever is common. Ask your health care provider if you should bring electrolyte packets in case you get sick. When traveling, drink only boiled or bottled water and eat well-cooked food.